1. a net drawn through a river or across ground to trap fish or game. a systematic search for someone or something, esp. criminals or criminal activity. “I think you have to have a shared collective memory of the past to recognize another human being,” writes Lawrence Jackson. His post, On Becoming More Human, examines the recent protests against police violence in Baltimore from his perspective as an African American man. I was happy to see Illana Feldman’s new book, Police Encounters: Security and Surveillance in Gaza Under Egyptian Rule, make the rounds on our twitter feed last month. In it, my former Anthropology professor at George Washington University discusses the topics of surveillance, control and police violence in Gaza during the period of Egyptian rule. Disclaimer: you’ll want to block off a few hours to tap into this one…it’s addictive from the start! “I think you have to have a shared collective memory of the past to recognize another human being,” writes Lawrence Jackson for n plus one magazine. His post, On Becoming More Human, examines the recent protests against police violence in Baltimore from his perspective as an African American man. Jackson is a professor of African American Studies and English at Emory University, and is the author of the 2012 memoir, My Father’s Name: A Black Virginia Family after the Civil War. His post undoubtedly earns my vote for “best of the month”- if you have time for one (and only one) read today, this is it. Those interested in coverage about the tragic police-related death of Freddie Gray shouldn’t miss NPR’s Weekend Edition that we shared late last month. In it, Scott Simon recounts his experience walking among the residents of West Baltimore in the wake of police protests. As the title attests, to many West Baltimoreans, the “largest gang is, in fact, the police.” We also recommend Ta-Nehisi Coates’ post, Nonviolence as Compliance, which was featured via The Atlantic. What does the concept of “touch” mean, in a policing context? 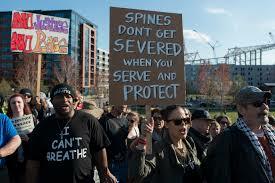 Mark Greif reflects on this question and more in his post, Seeing Through Police. He discusses the “rules” of police-citizen contact (i.e.- they touch you, you keep your hands to yourself), its many functions (intimidation, reassurance, “traffic direction”) and forms (hands vs. batons). What’s perhaps most intriguing about this post is its dual -and rather empathetic- consideration of police as police, and police as people. At the same time, it presents a critical and well-balanced portrait of modern police practices. Finally, we are pleased to offer continuing coverage of the American Anthropological Association’s developing initiatives regarding police brutality. AAA recently announced they’ll be offering a working group to monitor racialized police brutality and extrajudicial violence. Co-chairs include David Simmons, Marla Frederick and Shalini Shankar. You can view the Working Group charge here. In an unusual demonstration against Denver police, supporters of Jessie Hernandez have allegedly been expressing their discontent by stealing cars. 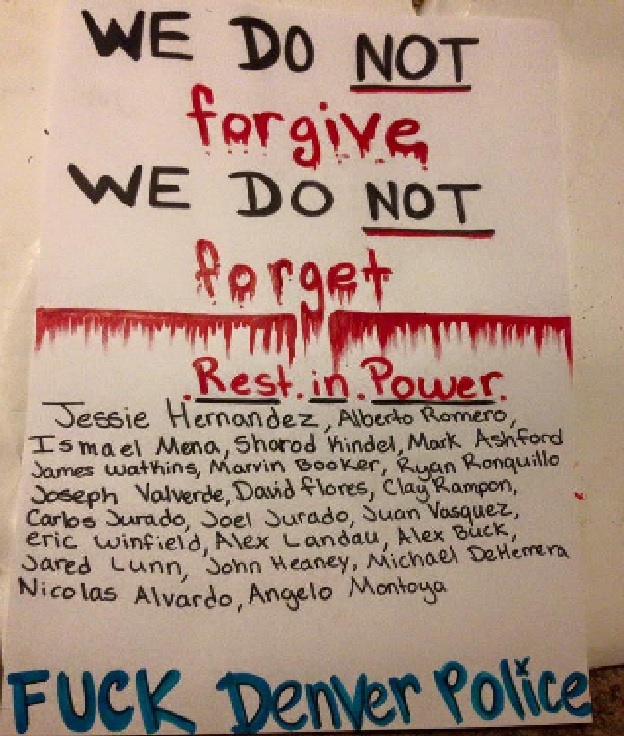 Hernandez was fatally shot by police in January. The police-involved killing of Walter Scott dominates policing news by far this month. Video footage, shot with the cell phone of a bystander who witnessed the event, seems to offer key (and yet incomplete) evidence of how the shooting evolved. Scott had apparently been stopped during a “routine traffic stop” for a broken tail-light. Although the video recording did not capture the full nature of the altercation, it did capture the officer proceeding to shoot Scott in the back while he was running more than 20 feet away from the officer. Edward Bryant II, head of North Charleston’s NAACP chapter was among those interviewed about the incident by Martin Kaste on NPR’s Morning Edition. While addressing the moment of the film that captured the officer “dropping something” -perhaps the very Taser Scott was charged with stealing- Bryant says that it “reflects something very distasteful…like it’s already been practiced. It’s been already done.” Among organizations taking a stance against the continuation of racialized police violence is the American Anthropological Association, who’s post we shared via Jeff Martin. Stay tuned for their specific initiatives regarding policing culture, which are to be listed soon. All Things Considered also joined the law enforcement culture conversation, with Audie Cornish’s interview with Seth Stoughton. Stoughton is an assistant professor at the University of South Carolina’s School of Law. He suggests the paradign of policing in American is is need of a major makeover; suggesting the current “warrior mindset” should be exchanged for one that is conducive to a “guardian” role. A 73-year-old undercover Tulsa reserve deputy sheriff who fatally shot an unarmed black man during an undercover operation gone wrong turned himself in on Tuesday last week. He allegedly mistook his gun for his taser; fatally wounding the unarmed man. Robert Bates has been charged with second degree manslaughter involving culpable negligence. He was released on $25,000 bail and is awaiting trial, according to Lindsey Bever and Sarah Larimer of the Washington Post. In an unusual demonstration against the Denver police, supporters of Jessie Hernandez have allegedly been expressing their discontent by stealing cars. As reported by Michael Roberts for Westword, Hernandez was fatally shot by police back in January after two officers responded to a call about a suspicious vehicle. According to one source, 126 vehicles have been stolen in the area since the beginning of the year, which is nearly double the amount recorded for the same period last year. 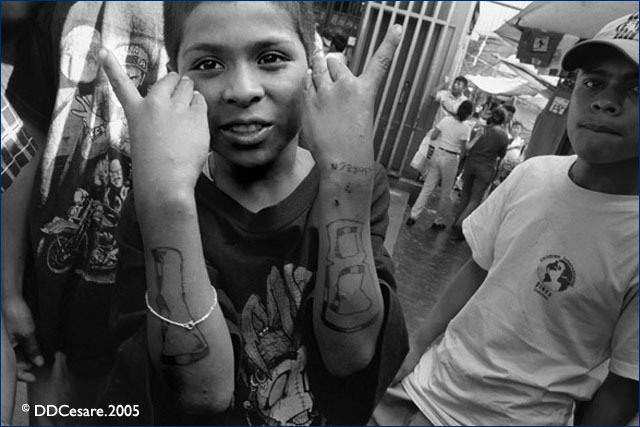 “What would it take for today’s gang members to bring peace to the neighborhood?” writes Laurence Ralph in his post for Anthropoliteia last month. Ralph recounts the story of his friendship with an elderly member of one of Chicago’s most notorious gangs, The Divine Knights. But the story reveals the little known history of the gang, as well as a strikingly “tender” side of the group previously known only among local community members. To record, or not to record; that is the question! Last month, we shared Carlos Miller’s post for Photography is Not a Crime. According to legislators in Texas, members of the general public should not be allowed to film or record officers by law. But a policy being proposed by a political duo in Colorado begs to differ. Joe Salazar and Daneya Esgar have teamed up to co-sponsor a bill that would award up to $15,000 (plus attorney fees) to citizens who have cameras or recording devices confiscated by officers without a warrant. You can read a copy of the proposed bill here and decide for yourself. The small town of Madison, Wisconsin is putting a whole new spin on the meaning of “officer next door” in an attempt to foster peaceful interactions between police and local community members. Melissa Block hosts this episode of All Thing Considered for NPR and details how officers and neighborhood residents have reacted to the police department literally moving in next store to high crime areas. The key to the community initiative’s success apparently lies in its exposure of officers and citizens to one another in everyday contexts- both good and bad. “What would it take for today’s gang members to bring peace to the neighborhood?” writes Laurence Ralph in his post for Anthropoliteia last month. Not that we need to remind you, but the newest Tip of the Cap feature is up and hungry for your feedback. Ralph recounts the story of his friendship with an elderly member of one of Chicago’s most notorious gangs, The Divine Knights. But the story reveals the little known history of the gang, as well as a strikingly “tender” side of the group previously known only among local community members. Laurence Ralph is an Assistant Professor of African and African American Studies as well as Anthropology at Harvard University. If you leave the post wanting more, be sure to check out his book, “Renegade Dreams: Living Through Injury in Gangland Chicago“. To end on a fun note (and just because I’m feeling random), treat yourself to browsing through Radio Free Europe Radio Liberty’s eclectic collection of bizarre Soviet Police posters from back in the day. Among my own personal favorites are, “concerned looking smoking guy” and “Gee! My facial angle looks great in this lighting!“. If you’re also the kind of person that likes a healthy amount of “crazy crap” on your walls, you’ll thank me for including a link that can hook you up with your next police-inspired addition. Speaking of departments that have gotten a bad rap, Police Chief Alejandro Lares Valladares of the Tijuana police department recently equipped officers with body-worn cameras. He hopes the initiative will both improve police-citizen relations while holding each accountable for their actions. You’d think members of a police department as big as NYPD would know somebody somewhere might be able to trace Wikipedia page edits to their network. We shared Kelly Weill’s post for The Capital, which exposes how a computer linked to NYPD allegedly altered information on Wikipedia pages about police use of force against Eric Garner, Sean Bell and Amadou Diallo. Also bleak is their revelation that additional edits have been linked to the same NYPD IP addresses for entries covering stop-and-frisk, NYPD scandals and local NYPD and political leaders. 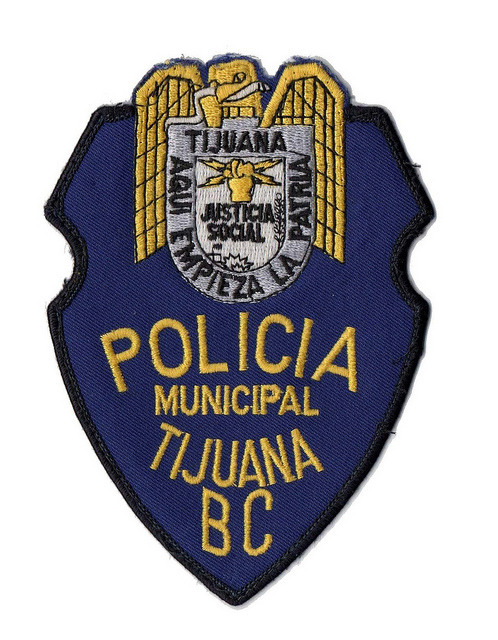 Speaking of departments that have gotten a bad rap, Police Chief Alejandro Lares Valladares of the Tijuana police department recently equipped officers with body-worn cameras. He hopes the initiative will both improve police-citizen relations while holding each accountable for their actions. Carrie Kahn of NPR recounts why, despite a long history of corruption, Lares believes the cameras will also capture how “citizens try to criticize my police officers.” Will body-worn cameras finally even the playing field? According to Peter Moskos, it’s not just NYPD or Tijuana officers who are guilty of corruption: it’s “The Whole Damn System!”. We shared his post for Cop in the Hood, which explains how the recently issued (and damning) DOJ report of Ferguson’s police department “is about a whole system of government using the criminal justice system to legally steal from its residents.” Do you agree with his conclusion that, “one could be blind to race and still be outraged?” Feel free to weigh-in in the Comments section. We previously shared AAA President Monica Heller’s call to fellow anthropologists to contemplate and discuss the intersection of race and justice. The events in Ferguson, as well as the subsequent police shooting of Eric Garner, made this topic one of utmost importance to the general public and scholars alike. In the same vein, we shared Jennifer Curtis’ post for Political and Legal Anthropology earlier this month. Learn how you (and/or fellow colleagues) can join this crucial discussion by submitting your ideas and suggestions to Jeff Martin at jmart@illinois.edu. APLA will be hosting a coordinated discussion of race and justice in Denver, November 2015. Whether your own interests lie within the field of anthropology, sociology or criminal justice, chances are that you’ve heard a little (or a lot!) about Emile Durkheim. In my favorite “open-access” voucher of the month, Berghahn Journals announced they will offer free access to some of Durkheim’s original works in honor of the 24th anniversary of the British Centre for Durkheimian Studies. You can enjoy reading his pieces in their original French, or English translated, versions. Spencer Ackerman’s post for The Guardian investigates a US-based policing “black site” known simply as Homan Square. Once inside the walls of this Chicago warehouse, constitutional rights are said to go out the window. It would appear that Ali Wajahat is not the only name in modern-day cop shows with a twist according to a post by Mike Hale of NYtimes.com. Comedian Colin Quinn’s series, creatively dubbed “Cop Show”, debuted in mid-February and is quickly accumulating nods of approval for its amusement factor. Look for cameos by big-wig comedians, such as Jerry Seinfeld and Jim Gaffigan, on this mock-u-mentary hit. You can catch up on the series- which is currently available for streaming- on LStudio.com. In far less cheery news, we also shared Spencer Ackerman‘s post for The Guardian, which investigates a US-based policing “black site” known simply as Homan Square. Once inside the walls of this Chicago warehouse, constitutional rights are said to go out the window. 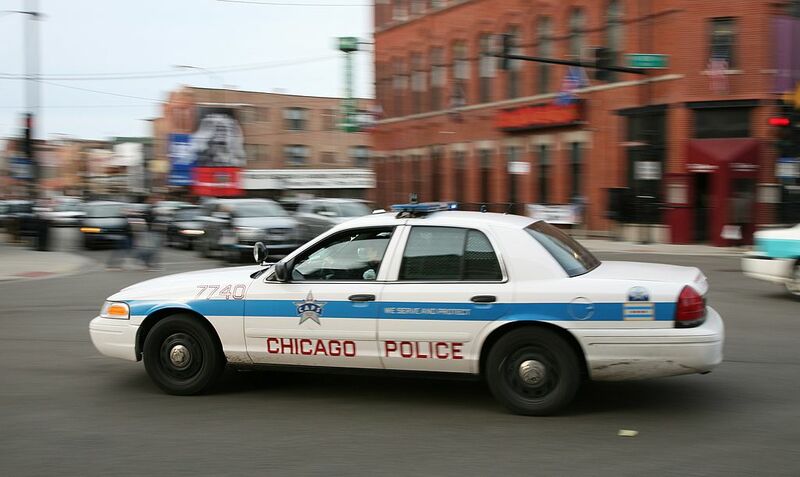 Lawyers interviewed by Ackerman report that it has become standard practice to assume apprehended individuals who remain “unlocatable” through otherwise standard procedures have landed themselves within the Homan black box. Follow ongoing coverage of the investigation by The Guardian here. We also recommend Alexandra Starr of NPR’s post for Codeswitch we featured earlier this month. A previous DragNet post asked, “When officers behave questionably, who you gonna call?” It appears Shea Serrano -staff writer for Grantland– has taken it upon himself to provide an answer to our quandary. His post, “The Second Banana Cop Matrix: A Definitive Guide to Who You Should Call for Backup“ wins my non-existent prize for best satirical post of the month (plus, after reading Homan Square coverage we could all use some comic relief, right?). Worthy of note is his shout out to my own personal favorite police “side-kick” ever: the kid from Last Action Hero. The President’s Task Force on 21st Century Policing released some recommendations for improving police-citizen relations this month, beginning with the regular measuring of “community trust”. Carrie Johnson‘s post for The Two-Way also recaps the Task Force’s stance on the ever-popular “body-worn camera solution“, with concerns about privacy packing a powerful punch. These recommendations came just days before the killing of Philadelphia Police Officer Robert Wilson, which is especially poignant given that Commissioner Charles Ramsey has a position on the Task Force. Also noteworthy is the fact that Wilson’s district is the site of PPD’s current body-worn camera pilot project. Also on the topic of police-citizen violence, a DOJ investigation into patterns of police use of force in Ferguson, Missouri found “alleged sweeping patterns of discrimination” within the city’s police department. But the discrimination doesn’t end there. The report also found that blacks were “68% less likely than other races to have their cases dismissed by a municipal court judge”. My personal LEAST favorite statistic, you ask? Of 21,000 total Ferguson residents, 16,000 of them were found to have outstanding warrants (often for minor violations). Stay tuned to our twitter feed for ongoing coverage!